PRIVATE LESSONS: We specialize & offer private lessons for most levels in Ballroom, Latin, Swing & many other dances in Pennsburg, PA. Please click on the Private Dance Lessons link under Today's Activities on the top Right side of this page for more information. WEDDING DANCE: Your first dance will be a memory that you will cherish forever. Let us help you create that memory with a dance prepared just for you. Learning to dance doesn't have to be stressful; we'll make it a fun & rewarding experience while helping you gain confidence and bringing you closer together. We will work with you to create the perfect dance to the song of your choosing. We work with couples as well as entire wedding parties, so whether you are looking for the perfect intimate atmosphere or a chance to get everyone involved we'll help you get there. MONTHLY SATURDAY EVENING BALLROOM DANCE LESSON & DANCE PARTIES: The next dance will be May 4th & the lesson will be BACHATA. Doors open 6:30pm. Beginner lesson starts @ 7:00, Intermediate lesson @ 7:30, dance party 8:00-10:30. Admission is $12/pp (with or without lesson - cash or check only please). Pay at the door. See details on the Right side of this page under Upcoming Activities. 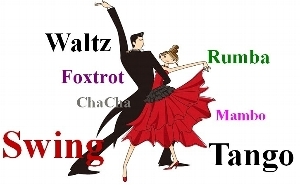 MONTHLY SUNDAY AFTERNOON BALLROOM DANCE LESSON & DANCE PARTIES: Our next dance will be April 28th & the lesson will be QUICKSTEP. Doors open 1:30pm. Beginner lesson starts @ 2:00, Intermediate lesson @ 2:30, dance party 3:00-5:30. Admission is $12/pp (with or without lesson - cash or check only please). Pay at the door. See details on the Right side of this page under Upcoming Activities. MONTHLY WORKSHOPS: We offer Workshops at the Studios on Main, Pennsburg, PA. Our next workshop is Intermedate FOXTROT, Sunday April 7, 2019. See details on the Right side of this page under Upcoming Activities. MUSIC: We have an extensive music library which has everything from the old classics to current - something for everyone! We pride ourselves on playing great music at our dances. We realize that preferences in music vary from person to person but one thing we know for sure is that it must be motivating, strict tempo music that makes us want to get out on the floor, stay out on the floor & dance. Our regulars love the music selections & we are confident that you will too. Got a request? If we have it, we'll play it. Everyone is welcome (singles, couples, experienced and beginners) to join us at our dances. Visit this page often for a list of all of our current activities and events. Need additional information?